Released in North America in October 4, 1993, and Japan March 20, 1994. The console was designed to "reshape the face of the videogames industry". Originally conceptualized that the 3DO design would be licensed to companies to build, sell, and distribute their own consoles. Panasonic, Sanyo and GoldStar (now LG Corp) were among the three major electronics companies that jumped on board initially. Sony was approached by The 3DO Company. However Sony decided to continue working on their PlayStation platform. SEGA was also approached, but SEGA opted out due to concerned over price. Some companies obtained licenses, but never actually built any consoles. These include Samsung, Toshiba, and even AT&T. The console when released was criticized for its excessive price. Generally, the suggested retail price for the console was supposedly around US$699 in 1993/94. However, the Goldstar Model launched at $399. 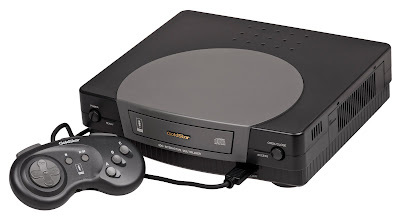 The reason for the high costs on the 3DO was due to the full cost of the console fell on the manufacture with no way to offset. For example, the PlayStation and Saturn consoles were expensive machines, but thanks to Sony and SEGA handling the licensing arrangements for games, they could offset the overall cost of the console onto the sale of games. Panasonic, Goldstar, and Sanyo did not have this option, as The 3DO Company handled the licensing arrangements for the games. The 3DO did have a line of popular titles released over the life of the console. However, a majority of titles were the bane of CD-ROM titles of the time...FMV games. The best games on the console were arcade "perfect" versions of games like Samurai Showdown, and Super Street Fighter II Turbo. Other popular titles include The Need for Speed, Road Rash, and Immercenary. The 3DO also had good ports of titles such as Wolfenstein 3D and DOOM. Ultimately, the 3DO failed. Due to the initially high price tag, a lack of "exclusives", and a library of games that appeared on less expensive consoles meant gamers weren't interested. Even the announcement of the planned, and ultimately failed, successor...the M2...the 3DO was officially discontinued in late 1996.